Giant cell (temporal) arteritis occurs after age 50. The erythrocyte sedimentation rate (ESR) is often markedly elevated (100 mm/hr or more). The C-reactive protein (CRP) is elevated, driven by increases in interleukin-6 (IL-6). Half of patients with giant cell arteritis may develop polymyalgia rheumatica. 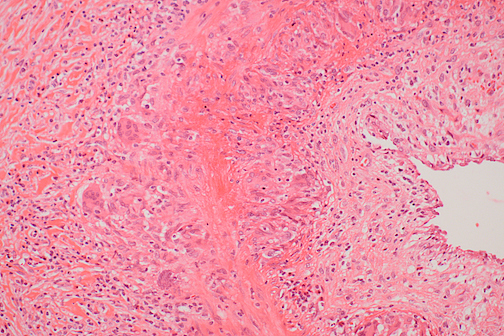 The focal granulomatous inflammation with narrowed arterial lumen is seen here at high magnification. Note the giant cells in the inflamed arterial wall.